On 9 August 2011 the Ukrainian Orthodox Church glorified a local Saint, the Venerable Eutropia Isayenkova of Kherson in Crimea. Little is known of St. Eutropia's childhood, but she was native to the Kherson region and born on 24 November 1863 to her parents Leontius and Agatha. Because she was born on the feast of St. Katherine, this was her name before becoming a monastic. At the age of twelve she was sent to nearby Aleshkovskii Monastery. Together with her education, it was here that she learned to love prayer and sacred studies. 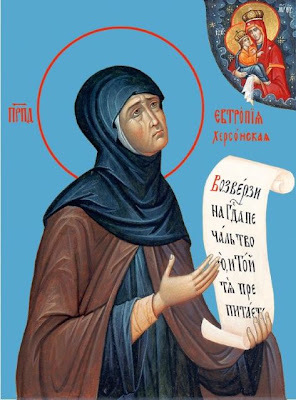 Eventually she dedicated her life to the Monastery and took the name of Eutropia, inspired by St. Eutropia of Alexandria (Oct. 30). Her monastic obedience was singing in the choir and reading. To others, she was known for her kindness and modesty. Eutropia witnessed the flowering of the Monastery, with the building of magnificent churches and a school for orphans. But soon revolution, civil war, famine, destruction, and the worst - the godless power of Communism interrupted the monastic life of the nuns. The Monastery was abolished, churches closed, the nuns dispersed. Eutropia, like many other nuns of the Monastery, went to Kherson. There she settled in the area of Kindiyskih near the Church of the Nativity of the Theotokos. During this time she earned a living sewing quilts. She and the nuns would often go to the church there to pray, but in 1938 it was shut down and they were forced to pray in a private home. When the Germans and Romanians came to Kherson in 1941, the churches once again opened. Many people would visit Eutropia and she eventually became renowned for her clairvoyance and commitment to praying for the dead who had no one to serve funerals or memorials for them due to the Soviets' closure of churches. God would reveal to her the names of the reposed in order for her to pray for them. A blank piece of paper near her bed at night was full of names by the morning for her to pray for. Many would visit her, even from great distances, so that the yard of her house seemed to always be full. Spiritual children testify that she wore fetters on her feet and in her hands was always a Bible which she studied. Though she received many gifts from the people, she only lived on unleavened bread and holy water, and everything else she gave to those in need. As she was near death her spiritual children would ask to whom they should now go to for their needs; Eutropia responded that they were to come to her grave as if she were among the living. When she reposed on 29 March 1968 she was 105-years old. The funeral took place in the Church of the Nativity of the Theotokos with thousands in attendance. She was buried in the cemetery Kindiyskom. At her grave many received her grace-filled help and healing. 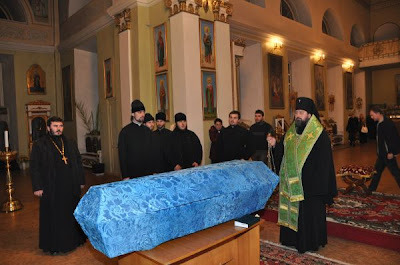 The Saint's relics now rest in Kherson's Cathedral of the Holy Spirit.